The 2nd New Hampshire Regiment, also known as the 8th Continental Regiment, was formed in early May 1775, as the second of three Continental Army regiments raised by the state of New Hampshire during the American Revolutionary War. Its first commander was Colonel Enoch Poor, with Joseph Cilley as major. The 2nd NH would see action at the Battle of Trois-Rivières, Battle of Trenton, Battle of Princeton, Battle of Hubbardton, Battle of Saratoga, Battle of Monmouth, the Sullivan Expedition and the Battle of Yorktown. At Hubbardton Col. Nathan Hale and part of the regiment were captured by the British Army. During the summer of 1783, the 2nd NH and the 3rd NH were merged into the 1st New Hampshire Regiment and were disbanded on January 1, 1784. The 2nd New Hampshire’s Regimental colours that were captured at Hubbardton and returned to the state of New Hampshire are now housed at the New Hampshire State House in Concord, New Hampshire. 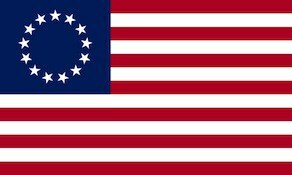 It is one of only a few American battle flags from the American Revolution known to still exist. This idea is under some dispute. The colors containing the motto “The Glory Not the Prey.” likely served the New Hampshire Brigade. The other colors captured at the time, the linked 13 rings, were likely divisional colors.